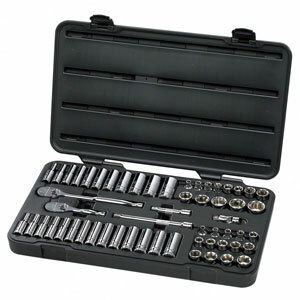 A good socket set will be one of the most important things to have in your tool collection. While you can get away skimping on some tools, this shouldn’t be one of them. There are a few common factors that make the top rated socket set stand apart from the rest. One of those factors is the number of gear teeth in the ratchet, where a higher number of teeth translates into a shorter required turning radius. Another factor is the number of “points” or corners inside the sockets themselves, with 6 providing the best grip in most situations and higher numbers allow more rounding of the fastener head. There are other factors, including the number of sockets and whether the set includes both SAE and metric sizes, but for long wear and specialized use, the ratchet and socket quality should be your guiding standards. TIP: Once you’ve decided on the best ratchet set for your shop or garage, be sure to keep everything in its place with a socket organizer if you plan on storing them in your tool chest or on top of your workbench. 6 pt vs 12 pt sockets – What’s the difference? Can I use regular sockets with an impact wrench? 1/4″ vs 3/8″ vs 1/2″ Drive Sizes – Which Should I Get? This impressive 192-piece ratchet set is far more than a pretty set in a box. The smooth 72-tooth gear system allows for high torque ratcheting, while the 5 degree arc swing makes it easier to reach at difficult angles. All sockets and screwdriver bits are deep laser etched for easy identification, and all sockets are designed for non-slip operation. 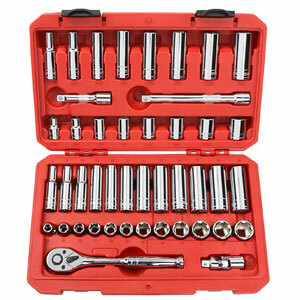 This is a great high quality socket set for DIYers and weekend mechanics and even good enough for pro mechanics. 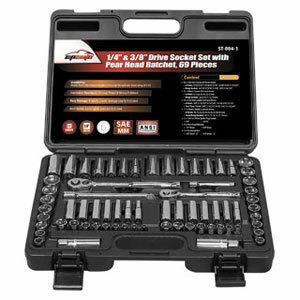 You get a nearly complete set of 6-point sockets, three sizes of ratchets, three extensions for each ratchet, plus allen wrenches, making this set more convenient and cost effective than filler sets. The overall quality is also what you’d expect from DeWalt tools, making this a great gift idea for a loved one (or yourself – you’ve earned it!). One thing to keep in mind is that the entire set has some weight to it and the case is quite a bit bigger than smaller sets. Unlike the GearWrench case, the DeWalt case is sturdy, the sockets snap right in to their labeled spot, and there are four latches to keep everything secure during transport. DeWalt, like many large companies, often commission smaller companies to manufacture tools under their name. This is probably the reason why some individuals have seen flaws in the craftsmanship that normally wouldn’t get past DeWalt’s quality control. A few consumers have also received incomplete sets that had duplicates. 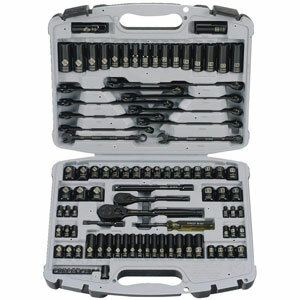 GearWrench ratchets are known for having the one of the shortest turning radius’s in the industry, producing the best socket set for work in close quarters because of the ratchet’s 84 tooth count gear mechanism. Since you can remove stubborn bolts with a minimum turning arc of 4.3 degrees, the set is indispensable for those who perform mechanical work in tight spaces. Socket sizes are stamped rather than laser-etched, so they will stand up to heavy use without losing their clear identification. 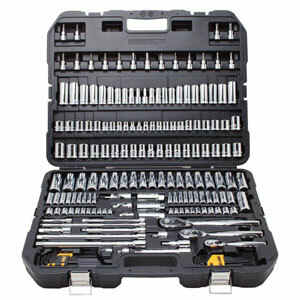 This 57 piece set includes most of the sizes needed for anything other than the occasional specialized job. Sizes included are 1/4-inch to 1-inch standard sockets, 1/4-inch to 7/8-inch deep sockets, and 6mm to 19mm standard and deep sockets. Unlike cheaper 6-point sockets which lack grip, GearWrench has developed their patented Surface Drive technology to promote easier removal without rounding the heads of nuts or bolts. Some users note that the ratchets seems to have a “loose” feel, but this is related more to the precision of the high tooth count than to a defect in manufacturing. GearWrench can stand up to heavy use under harsh conditions without stripping the mechanism or rounding fasteners. The biggest negative has to be the plastic case. Sockets fit loosely and the hinges have been know to break over time. Fortunately, most users will store their sockets in a dedicated socket organizer but if you need a set for on-the-go use, consider another option. Another small nitpicky item is that there is no quick-release button for the sockets. It would have been nice but we assume GearWrench didn’t want to add to the thickness of the ratchets. While not perfect, the GearWrench 80550 is currently our pick for best 3/8″ ratchet set for the money. Note: Since GearWrench has become a brand of the Apex Tool Group, production of many of their newer tools has moved from Taiwan to China which is not for the better. As of right now, most socket sets (except the ratcheting type) are still being manufactured in Taiwan. A division of Snap-On Tools, JH Williams is well known in the mechanics community for making high quality tools and their socket set doesn’t disappoint. This 3/8 inch set is made of high grade Cr-V steel to ensure a long lifespan. The SuperTorque lobular openings create superior turning power for a standard socket with less risk of deforming the fastener. Packaged in a durable polyethylene case, this set consists of a 3/8″ ratchet, extensions, as well as 8 each of deep and shallow SAE sockets, 14 shallow metric, and 13 deep metric sockets – all in 6-point. Users have compared this set to similar old-school Craftsman offerings (not to be confused with the newer, cheaper Craftsman), and the Williams set meets or beats many high end competitors. This is a top quality set that will stand up to heavy duty use. The ergonomic handle makes for a more comfortable experience when spending long hours under the hood. Best of all, the swivel attachment allows you to get into places otherwise inaccessible. A few customers have had problems with receiving 12-point deep sockets or other shipping errors. In addition, the case isn’t as durable as others on the market, but it should hold up well enough for most users. If you don’t consider price, this SK socket set may actually be slightly better quality than the sets above, but it may be overkill for the typical home mechanic. If you have the money and consider yourself a medium to heavy user, this SK set is definitely worth considering. Made in the USA, the set includes a high quality non-slip ratchet, extensions, as well as a handy thumbwheel ratchet. Because the SK ratchets don’t have as many teeth as other top-ranked ratchets, it may not be the best choice if you plan on doing a lot of work in tight quarters but it’s great for high torque applications. On the other hand, the 6-point Sure-Grip sockets will grip fasteners more tightly than the competition, resulting in easier removal without slipping or rounding of the fastener or the points of the sockets. 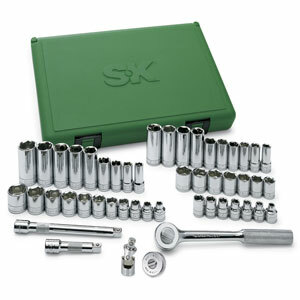 SK tools are professional grade, and will be suitable for any job you throw at them. It would be nice to have a shorter wing arc, but the trade-off is a heavier ratchet that can stand up to having a tremendous amount of torque applied without stripping the internal gear system. The size markings are engraved, and chrome coating could be more durable, but the set should outlast most others if you handle them as they are intended. The limited lifetime warranty will cover replacement in most cases. Possibly the best ratchet set for the money, the Stanley 92-839’s slim, pear-head ratchets have a minimum turning arc of 7 degrees. The 2 ratchets also includes proprietary technology to increase torque by as much as 15%, and the 6-point sockets are designed to reduce rounding. Including the most common sockets for both SAE and Metric uses makes this set more widely applicable than other smaller sets. While this set is perfectly fine for most jobs, for higher torque applications such as with impact wrenches, you’ll want to use impact sockets instead. The black chrome is sharp (and preferred by many), doesn’t show dirt or grime, and offers better corrosion resistance than regular chrome, but the socket sizes are laser etched rather than stamped. This means that heavy use could wear the labeling off and make it hard to identify individual sizes. The case itself is just okay. Most report no issues but others say the case doesn’t hold some sockets or wrenches during transport while others mention it holds them a bit TOO well making them hard to take out. Seems like consistency with the case design may be an issue but the tools themselves get rave reviews. 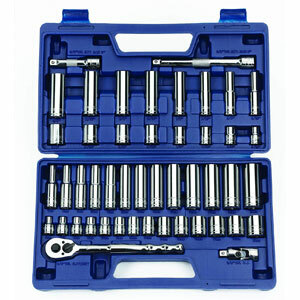 Overall, if you need a socket set for light or medium duty use, this Stanley set might be a great fit for you. One of the best values around, this Tekton set carries a complete range of sockets, ranging from 5/16 inches to 3/4 inches in shallow and deep, plus 8mm to 19mm shallow and deep. Additionally, this set includes a universal joint, 6-inch extension, and 72-tooth ratchet with 5 degree swing arc. All pieces are made from premium quality Cr-V steel with a mirror chrome plated finish for a lasting, attractive addition to any tool collection. Tekton doesn’t joke when it says this is “no sizes skipped”, as evidenced by the presence of a somewhat rare 5.5mm socket. Consumers claim the case and sockets are all expertly crafted, and the case itself is very clearly marked. They also note that the quality meets or exceeds Craftsman while remaining affordable. A few consumers have complained about the etching size, stating that it can be difficult to read. The case has also proven problematic for individuals, sometimes not holding the metric sockets securely. This latter complaint seems to be due to a bad batch, as most owners have not suffered the same problem. This popular, affordable set contains both 1/4-inch and 3/8-inch sockets in metric and SAE sizes. All pieces are made of hardened treated Cr-V steel alloy with mirror polished chrome plating for beauty and durability. A pear head ratchet and extension is included for each drive size, making this an excellent choice for those starting a new tool collection. You’ll probably be pleasantly surprised with the quality as soon as you open the case. Many owners keep this set as part of their emergency vehicle kit due to the compact size of the case. The range of standard and deep sockets included will cover almost any repair task. As with many other socket sets, the 92-824 has been known to arrive with a duplicate instead of a different piece. On rare occasion, owners have reported an excess amount of plating, making it difficult to fit the affected socket to a ratchet. For the money, this is an excellent starter set to have in the garage or as a backup for the car. While they might look straightforward on the surface, socket wrenches can be a surprisingly complicated topic. The number of points, the type of socket (standard or impact), and drive sizes all come into play when performing a task. Here’s what you’ll need to know to get the most out of your set. Beyond the obvious answer, there’s actually a lot of distinction between the two. 12-point sockets are good for light work, but this is about the extent of their usefulness. Meanwhile, 6-point sockets have thicker walls, making them much sturdier. 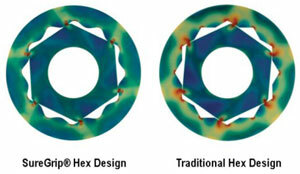 They’re also far less likely to slip off or round edges when dealing with torque. Finally, because they’re designed to apply force to the flat sides of a fastener, a 6-point has far better grip than its 12-point counterpart. Yes and no. Regular and impact sockets use the same drive sizes, making them cross-compatible on a technical level. Practically speaking, impact sockets are designed to handle much higher torque. Using a regular socket on an impact wrench increases the chance of cracking or shattering the socket and is thus not recommended. Each of the three drive sizes have a purpose, making it difficult to stick completely to one size. For most jobs, however, the 3/8 inch drive works perfectly fine. For higher torque applications such as lug nut removal or using a breaker bar, you’ll want the thicker 1/2 inch drive. Meanwhile, the 1/4 inch drive’s smaller size gives it an edge when up against tight spaces or recessed nuts. Minimum arc for GearWrench ratchet is incorrectly stated as 6 degrees. If the number of teeth in the ratchet gear is 84, the correct minimum arc is 4.3 degrees (rounded up to 1st decimal) calculated by dividing 84 into 360 degrees (a complete circle). Many good ratchet wrenches use gears with 72 teeth, a number which divides evenly into 360 degrees, and gives a minimum arc of 5 degrees (360 divided by 72 = 5). A ratchet that actually had a minimum arc of 6 degrees would have 60 teeth (360 divided by 60 = 6). Thanks Robert. You’re absolutely correct and I’ve made the correction. It appears that a few years ago, Gearwrench included a 60-tooth ratchet in this set which was later updated to the current 84-tooth model. I inadvertently used the old specs. I know this is just an affiliate site (and I applaud that it’s disclosed at the bottom). But I need to comment that the vast majority of GearWrench products are now produced in China–somewhat puzzling since Apex is positioning GW as their premium line (since they killed off Armstrong, Allen, and Matco was part of a spin-off). By the statement in the description of the GW set, tools produced in China are not high quality. It would be nice if there were some high quality Chinese-produced tools to dispute the claim, but it’s noticeable that GW quality has decreased after the move of production. Thanks for the comment. As far as I know, GearWrench sockets (except the ratcheting type) are still made in Taiwan. But you’re correct, more and more of their products are now being made in China and it’s probably a matter of time until their entirely lineup is (I hope I’m wrong). I remember when GW tools were still made in the US. Unfortunately, it seems like Apex is swallowing up companies left and right and moving production to where I assume is the cheapest to manufacture. If they’re not careful, GearWrench will just become the next Craftsman. For now, I stand by the top pick above as I still think it’s an great set but if they do switch production to China, I’ll update the article as necessary. I can confirm the GW set I purchased last Christmas says it’s made in Taiwan. You should make a correction about the SK set. The chrome sockets are not laser etched. They sizing is engraved in the socket. The impacts are laser etched and engraved. Thanks Norm. You’re absolutely correct. It’s been corrected. GearWrench chrome sockets are still made in Taiwan but their CR-MO impact sockets are made in China. The 1/2″ drive CR-MO impact extension set I recently purchased was made in Taiwan. There are etailers, zoro.com and acmetools.com come to mind, that list the country of origin but the country of origin is always subject to change. BTW GearWrench CR-MO impact sockets are excellent sockets and the sets come in great cases. I tend to try to avoid tools from China as well as from other communist countries due to political reasons but price and availability are also part my my purchasing decisions. so as far as impact sockets go I generally buy Sunex or Grey Pneumatic over Bain Capital’s Apex tool brands such as GearWrench. As far as quality goes GearWrench chrome and CR-MO impact sockets are great. Warranty isn’t much of a concern to me, the only mid to high quality tools that I’ve broken in the last 50 plus years were the ones I abused. I’ve replaced many more lost/stolen tools than broken ones. Nothing beats the Williams set that was handed down to me but SK comes pretty close as far as sockets are concerned. I completely agree. We’re actually in the process of updating this article and it’ll include a set by Williams.